The Error! Reference source not found. 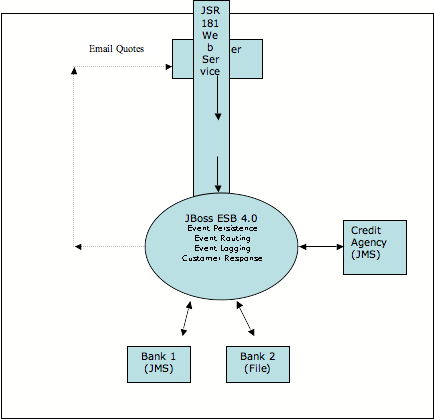 contains information describing the Loan Broker Scenario deployed with the JBoss ESB 4.0 Beta 1. The information in this document is meant to help understand how to use the ESB in a �real-world� scenario not unlike what many developers and architects might face in their day to day project work. 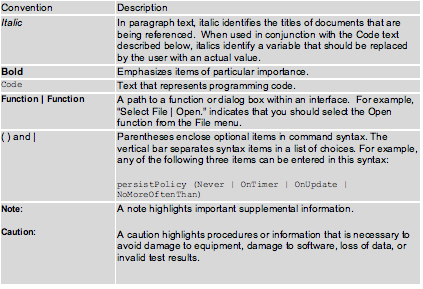 Note:For the beta release, we recommend that you use this manual in conjunction with the Programmers Guide, the user forum (http://www.jboss.com/index.html?module=bb&op=viewforum&f=246) and the javadocs associated with the code. Chapter 1, Scenario Overview: What is the �problem� we are applying the JBoss ESB against. Chapter 2, How to Deploy: A step-by-step how-to deploy the trailblazer and run it. The purpose of an ESB, as part of an SOA strategy and architecture, is to be the central command and control through which disparate applications communicate, publish, and ultimately consume data to and from the enterprise systems in an organization. It is also ideally suited to allow your in-house systems to communicate with your partners systems. Now that we created the JBoss ESB 4.0 Beta 1 release, we needed a scenario, or a problem domain to address. A tool is only as good as the problem it solves the saying goes. With that in mind, we needed some sort of scenario which would allow you to easily see the features and capabilities of the JBoss ESB, and how it could aid you in your enterprise with your particular needs. One such scenario has already been documented and prototypes by other ESB vendors, because it is such an obvious scenario that anyone can relate to. The scenario is the Loan Broker, as described in the EAI Patterns website. Why come up with a different scenario? If it�s good enough for the EAI Patterns guys, it�s good enough for us as well. A Loan Broker system is responsible for collecting Loan Requests from Customers and then forwarding those Requests to Banks for Processing. Once the Banks have processed those Requests, Quote Responses, if any from each of the banks is sent back to the Customer for their review, and hopefully for the bank�s sake, acceptance from the Customer. The Loan Broker needs to collect the data required by each of the banks, log it, and then forward it to each of the banks using the communication protocol and data format that each bank expects to receive such data. Once the bank has decided to issue a Quote, the Loan Broker must receive the data, again in a unique format and communication protocol specified by each of the banks. In a nutshell, the Loan Broker is required to: collect, transform, and ship data around to various systems; an ideal candidate for an ESB solution. a simulated set of Banks (2) which will receive and transmit data in 2 distinct format and communication channels. For more detailed information on how the simulated Banks work, please look at the source code found in the source packages through SVN access. Remember please that the Banks are a simulation. 4. 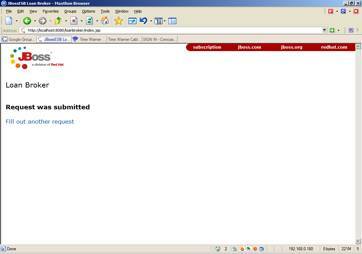 Deploy the sample JSP page into your JBoss AS installation. [input] This script will help you configure your local project for running the JBoss ESB LoanBroker Trailblazer. You can reconfigure the Trailblazer at any t ime by re-running this script. [input] The following questions will configure the email notification parameters required by the Trailblazer. [input] That's it, the Trailblazer is now configured! You can reconfigure the Trailblazer at any time by re-running this script. Please see the Getting Started Guide for more information on how to do this. 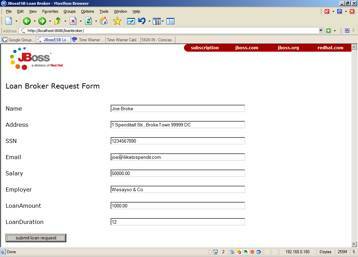 Open a browser and navigate to http://localhost:8080/loanbroker.